In order to prevent the invasion of African Swine Fever (ASF), the Bureau of Animal and Plant Health Inspection and Quarantine, Council of Agriculture, Executive Yuan (BAPHIQ) and customs have been strengthening border inspection by conducting thorough inspections on carry-on baggage of all air passengers arriving from high risk regions such as Mainland China, Hong Hong, and Macau since January 16, 2019. Starting from February 19 and March 9 respectively, Vietnam, Cambodia, Myanmar, Laos and Thailand have also been listed by the bureau as high risk regions. To facilitate carry-on baggage inspections, Kaohsiung Customs acquired three additional X-ray baggage inspection machines, two of which were installed at Kaohsiung International Airport (KIA), and the third one was installed at Tainan Airport. Officially put to use on March 13, these machines are supposed to help prevent the attack of ASF, securing the development of related industries in the country. 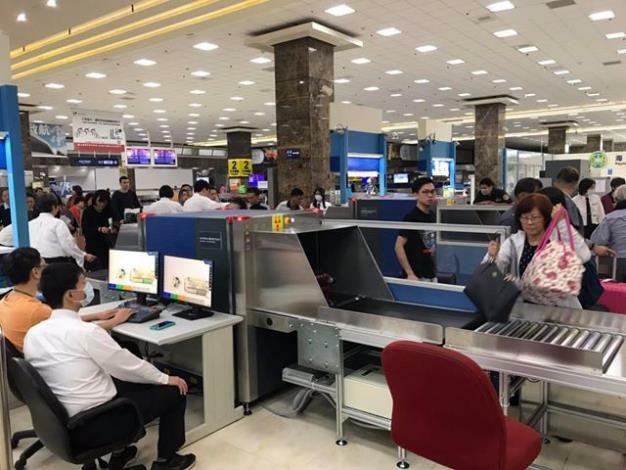 According to Kaohsiung Customs, from January 16 till March 10, 2019, a total of 291 cases arose at KIA where inbound passengers carrying meat products subject to inspections (Net Weight: 412.1 kilograms) were found to have passed through customs through the green line counter (“Nothing to Declare”). These cases have been transferred to the BAPHIQ for further actions. Among the cases, there were 32 occasions where passengers were fined NT$200,000 each for bringing along pork products made in infected areas (Net Weight: 29.07 kilograms). Meanwhile, the BAPHIQ has implemented a measure since January 25, 2019 where foreign passengers violating the regulations but failing to pay the fines shall be denied entry into the country. Since then, a total of 10 passengers have been deported for not paying the fines in full. With the dire threats posed by ASF, the mission of preventing the disease is utterly important and has a long way to go. During the Chinese New Year holidays, the number of travelers and people returning to hometowns increased dramatically, presenting a tough challenge to the prevention strategy. Fortunately, thanks to the cooperative advocacy by aviation operators and travel agencies, as well as to the in-depth and comprehensive reports delivered by the news media, both foreign and local passengers have been able to properly recognize the hazards of ASF, and have cooperated with customs when having their carry-on baggage inspected. Kaohsiung Customs truly appreciates the co-operations, especially the patience demonstrated by the passengers while waiting for the inspection of baggage. Kaohsiung Customs further indicates that it will perform its duties by constantly reinforcing the measures of border control, striving to implement Premier Su’s “exhaustive prevention of disease” policy. Passengers are reminded not to carry meat products from any infected areas into the country so as to avoid penalties, as well as to protect the safety and development of the domestic livestock industry.